Word of this movie has been spreading through the American ex-pat community so I watched the trailer. Some of the word has been disparaging, people knocking it for being schlocky, unrealistic, etc. An American girl gets dumped by her boyfriend in Tokyo. She searches for a meaning in her life while struggling with the culture clash and decides to try her hand at making ramen. The grumpy chef who trains her reminds me of Pat Morita in the Karate Kid for some reason. I figured I would at least give in a try, it looks watchable (and since when have Hollywood script writers cared at all about realism?). I have a tendency to like movies other people trash. BTW, I like your blog, are you in Japan yet? We want to go back but it will be a while to build up the funds again. Its fashionable to bash this movie all of a sudden in the ex-pat community. 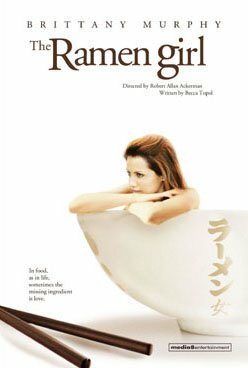 It's not a deep movie that explores the culture of Japan or the depths of the ramen craze.